For his 22nd birthday Sean Escobedo gave his teammates a present: a game-winning goal with 1:22 remaining in the third period, breaking a 2-2 tie and providing the margin of victory against UMass. Escobedo chipped the rebound of a Danny Regan shot past goalie Kevin Boyle. The win at the Mullins Center in Amherst gave BU a sweep of the weekend series. Terriers had given up a power play goal late in the first period and then a penalty shot a minute into the second period. After that, freshman goalie Matt O’Connor was perfect, turning away 34 Minuteman shots overall and 20 in the third period alone. Minutes after the penalty shot, Captain Wade Megan cut the lead in half converting a rebound from the goalmouth. Later in the period Matt Nieto’s first of the season, a deflection of an O’Regan shot, knotted the score at two. Garrett Noonan and O’Regan each contributed pair of assists while Nieto also had a multi-point game, assisting on Escobedo’s game-winner. Associate Head Coach Mike Bavis was behind the bench again for BU as Jack Parker’s bad back kept him from making the trip to Amherst. Terriers travel to North Dakota next weekend for a pair of games that will be televised locally on NESN and nationally on Fox College Sports. Coach Bavis on O'Connor: "His performance speaks for itself. Bavis expects Sean Maguire and Sam Kurker to play next weekend in North Dakota. 2013 recruit Kevin Duane scored his third goal of the season in Waterloo’s 3-2 win against the NTDP U17s. Duane has 7 points in 9 games for the Blackhawks. 2014 recruit Jack Eichel recorded an assist and also drew a penalty shot, which he did not convert. Freshman Sarah Lefort scored twice and junior Kerrin Sperry pitched a 24-save shutout to lead the Terriers past Robert Morris, 3-0. The win boosts BU’s record to 7-1-0. 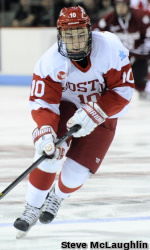 Kayla Tutino scored the other BU goal with Jennelle Kohanchuk picking up an assist for her 100th career point. Terriers return to conference play on Wednesday with a home game against BC—weather permitting. Freshman Danny O’Regan scored a pair of goals, including the game-winner and rookie netminder Matt O’Connor turned aside 28 shots to lead BU to a 5-2 win again UMass. A second-generation Terrier whose father was BU captain, O’Regan gave BU a 2-0 lead 4:45 into the second period, deflecting home a slick goalmouth pass from freshman Matt Grzelczk. He extended the lead to 3-1 early in the third on BU’s first power play goal of the season. Cason Hohmann, an early season standout, recorded his second three-point game, setting up Wade Megan for the games for goal and then scoring the final two goals himself. Alex Privitera also had a multi-point night with a pair of assists. -Hohmann has six points in three games, after scoring eight points as a freshman. -Through three games, O’Connor has stopped 69 of 73 shots for a .945 save percentage. -Grzelcyk’s slick entry passes led to both O’Regan goals. -Freshmen Ahti Okasanen and Mike Moran made the their NCAA debuts in the win. -Coach Jack Parker watched the game from the press box, due to a back injury suffered earlier in the week, leaving Associate Head Coach Mike Bavis in charge behind the bench. More than 75 BU hockey alums including 17 who have played in the NHL (LIST) were on hand at Agganis Arena to join in the recognition for Jack Parker’s 40th season behind the Terrier bench. During the first intermission, all-time leading BU scorer John Cullen and Travis Roy presented Parker with a plaque to mark the occasion. Before the game, same some of the alums, including Mike Grier and Freddy Meyer, signed autographs for fans on the Agganis Arena concourse. Check back for a list of the hockey alums in attendance. Terriers remain undefeated in Hockey East play following after doubling up Maine, 4-2, at Walter Brown Arena. Terriers got goals from Kayla Tutino (2), Shannon Doyle and Jenelle Kohanchuk. Senior Alissa Fromkin stopped 16 shots to earn his first win of the season. BU outshot Maine, 36 to 18. #13-ranked BU begins its first two-game weekend tonight, hosting UMass in a 7:30 p.m. start at Agganis Arena. The Terrier lineup will feature three new lines, with only the Wade Megan-Cason Hohmann-Evan Rodrigues (photo) unit remaining intact. Finnish blueliner Ahti Oksanen, who impressed in the exhibition game, makes his NCAA debut as Garrett Noonan’s partner. Matt O’Connor, who has a 1.41 GAA and a .953 save percentage, starts in goal. Junior Matt Nieto is BU’s top returning scorer against UMass with 10 points in six games. We’ll post a list of all the returning alums when it is available. ►The Webcast of tomorrow’s game at the Mullins Center in Amherst will be accessible to BU fans who are subscribed to Terrier TV. The two schools agreed to enable access to each other’s Webcasts. John Curry is back in North America after two seasons with the Hamburg Freezers in the German DEL. He signed on with the ECHL Orlando Solar Bears and was the winning goalie this past weekend in a 4-3 win over Florida that took 12 rounds of shootout to settle. Curry stopped 11 of 12 bids. 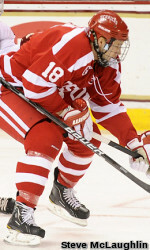 A two All-American and in 2006-07 Hockey East’s Player of the Year and a Hobey Baker finalist, he led BU to the 2006 Hockey East championship. Also in the ECHL are Justin Courtnall (South Carolina Stingrays), Corey Trivino (Florida Everblades) and Clark Donatelli, who is head coach of the Wheeling Nailers. Trivino scored his first ECHL goal Wednesday night in a 5-4 loss. #3 ranked BU hosts Maine tonight in a 7 p.m. start at Walter Brown Arena. Tomorrow they’ll play a fifth straight home game, meeting non-conference rival Robert Morris. Co-captain Marie-Philip Poulin and Isabel Menard lead the Terriers in scoring with 11 and nine points, respectively. ● GoTerriers.com preview, with links to game notes, GameTracker, Twitter Updates, WTBU Radio Webcast and Terrier TV Webcast. Terriers fell two spots in USCHO rankings to #13 after their loss to New Hampshire. BU begins a home-and-home series with UMass on Friday. Wade Megan and Matt O’Connor were named Hockey East’s top performer list. ● College Hockey News’ Hockey East power rankings. ● Freshman blueliner Matt Grzelcyk was a guest on the DA Show on The Sport Hub 98.5 this evening. 2013 recruit Kevin Duane earned first star honors in Waterloo’s 6-2 win against the NTDP U17s, scoring a goal and two assists. 2014 recruit Jack Eichel had a goal for Team USA. 2013 recruit Dalton MacAfee is playing in the Mass Midget Select League this fall with the first-place Cape Cod Whalers. Marie-Philip Poulin and Kerrin Sperry earned Hockey East honors for their efforts in Sunday’s 5-1 win against #2 Cornell. Poulin, who scored twice—including the game-winner— and had six points for the week, was named co-Player of the Week. Sperry stopped 75 shots in three games and was named Defensive Player of the Week. Jill Cardella, Sarah Lefort and Isabel Menard made the top performers list. 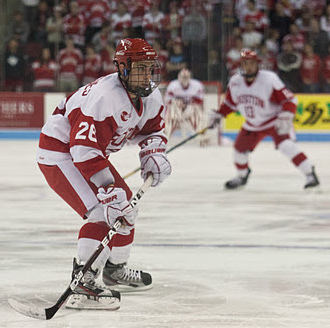 Following their two-game split with the Big Red, BU held on to its #3 ranking. #11 Terriers dropped a 4-1 decision to #15 New Hampshire last night. BU scored on its first shot of the game as Captain Wade Megan (photo) one-timed a perfect centering pass from Evan Rodrigues. After that, the Wildcats’ Casey DeSmith turned away 24 BU shots. The hosts took the lead with two goals within 18 seconds midway through the first period and added a pair in the middle period. Turnovers and tight checking by UNH plagued BU particularly in the final two periods. Freshman goalie Sean Maguire had a rough initial start and was replaced by Matt O’Connor midway through the game. 2013 recruit Brendan Collier scored a goal and two assists in the Valley Junior Warriors' 6-3 win against the Islanders. Collier is the Warriors leading scorer with a 6-8-14 line in 13 EJHL games. ● New England Hockey Journal feature on the Warriors "Dream Line"
#3 Terriers lost to #2 Cornell, 5-2, in the program’s first-ever evening game at Agganis Arena before a record crowd for the women’s of 1,891. BU took a 2-1 lead six minutes into the second period on goals by Marie-Philip Poulin and Jill Cardella, but the Big Red scored a pair of short-handed goals midway through the period. The visitors added an even-strength goal late in the third, followed by an empty-netter. The teams meet again this afternoon at Walter Brown Arena in a 2 p.m. start.